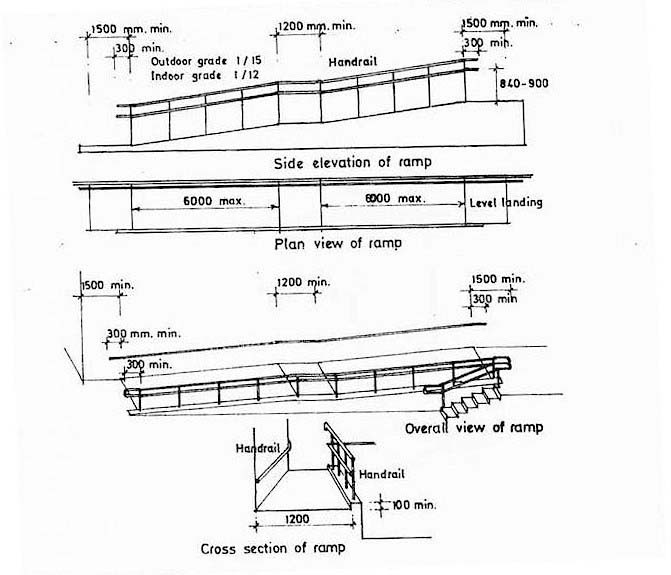 A ramp should be of gentle gradient, with a landing maximum every 6 meters. The ramp width should be min. 1200 mm clear. A ramped approach should have handrails continuously on both sides, and raised kerfs on open edges. Handrails should extend horizontally beyond the top and bottom of the ramp.(min. 300 mm). Ramp and landing surfaces should be slip-resistant. Other requirements of handrails should comply with the guidelines for "Handrails/Grab Bars". Ramps and landing surfaces should comply with the guidelines for "Ground and Floor Surfaces".